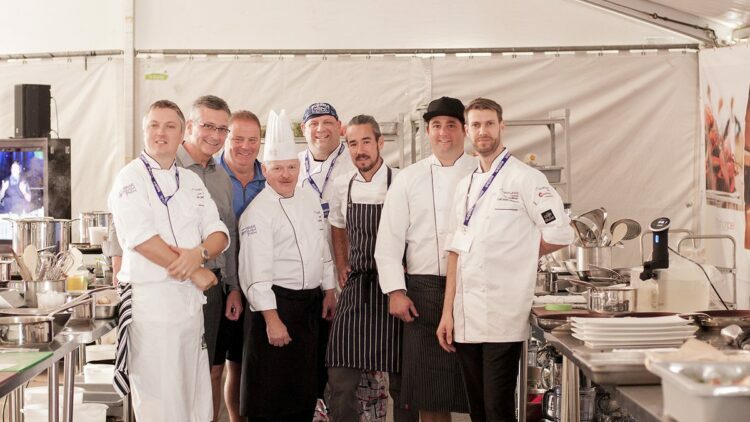 The final installment of Mark Andrew’s blog about the PEI Garland Canada International Chef Challenge and how the move from competitors to companions took place. After four hours sleep, I woke at 7.30am to see the chefs leaving to take part in the chowder challenge. Andrew McLeod and I, the two finalists don’t take part in the chowder challenge. Andrew and I agreed to meet Kevin Boyce at 10.30 am at the Culinary Institute of Canada to shop for our final dishes. I knew what my final dish was going to be, the last piece of the puzzle came to me that morning. I spotted French toast on a hotel menu and I decided it would be the egg component of my breakfast-inspired dish. This choice was part of my downfall. I wrote my shopping and prep list in time-order starting with the priority at the top. Part of the competition was to name the dish and description. I named my dish “Everything that is past is prologue to this….” Breakfast is a beginning but it can also be someone’s end. With hindsight, I am not sure I conveyed the meaning of this well enough to the judges. I finished shopping and set up. We were allocated 1lb of chanterelles for the whole competition, these were actually foraged by one of the school’s tutors, Hans. They where incredible and a perfect fit for my breakfast theme. I sorted through the last of my mushrooms and took what I needed plus a little extra, trying not to work ‘net’ as I have been accused of in the past. Truth is I should have taken the whole bag! You will see why later. While we were waiting, Andrew and I spoke to each other at great length about our journeys as chefs, anyone overhearing us wouldn’t believe we were about to compete for $10,000. Andrew even spoke to me about us collaborating at his new restaurant! We watched the chowder challenge which got us both relaxed and ready. We were treated like VIPs, and constantly being stopped to have our photos taken. Strangers wished me good luck and complimented me on the food I had cooked in the previous heats. It was a humbling experience. Fast forward to the setting up my station; we had more room than before and six inductions. And they were much more powerful, which I learned the hard way. Our food was delivered and we were ready to begin. I noticed in previous heats that both Andrew and Adam whom I respect greatly listen to music on their headphones whilst setting up. I adopted this approach too, and I have to say it had a calming effect on me. Hats off to them for this tip. The last song I remember hearing was “Wrecking ball” by The Boss, it may have turned out to be phrophectic! And then disaster struck; my 8 beautiful chanterelles had scorched! Panic, I had to discard and start again. I only had 4 mushrooms left, my intention had been to serve 2 each, but that wasn’t an option anymore. I dipped the bread into the custard and then into my pan, but it was cold. (Get it together Andrews, I thought, or words to that effect). I spun and looked at my list to discover the crab meat wasn’t in the custard. Too late because the bread was in the pan. I ramped up the temperature to maximum and started pureeing the ketchup. Over the noise of the vitamix blender I heard other chefs shouting. Having no idea what they were saying, I pointed to them and shouted “shut it!” My concentration was broken; I turned back to the stove to see that my French toast was turning dark brown. I realised that’s why the chefs were shouting. I apologised to them after the final! I pulled my toast off the stove, they were borderline overcooked. Everything was ready to plate and I was down to about 6 minutes. I asked my amazing assistant from the Culinary Institute of Canada to count us down minute by minute. Toast down, crab mixture down, 5 minutes, lobster down, ketchup down, 4 minutes, celery salt thrown down, 3 minutes, poached clam down, mushroom down, potatoes crisps down. I knew I was well in time, so I swiped the ketchup, looked at my plates and felt pleased that I had achieved what I intended. With a shout of “30 seconds left” I wiped the plates and stepped back. Job done! Andrew and I shook hands, hugged and wished each other ‘good luck’. It was an incredible moment. I drank a little beer and sat still for 20 seconds. Some of the other chefs came to help me clean down, awesome. Andrew and I were invited to the stage, and Andrew was deservedly crowned winner. It was his second attempt competing in the PEI Garland Canada International Chef Challenge. He was a ferocious competitor and a humble champion. Thank you to everyone involved in the PEI Garland Canada International Chef Challenge particularly the other chefs in the competition. I truly believe they shaped the experience. I left the competition with my head held high, having got further than I had ever hoped. I made friendships that will inspire me to greater things and have unforgettable memories.